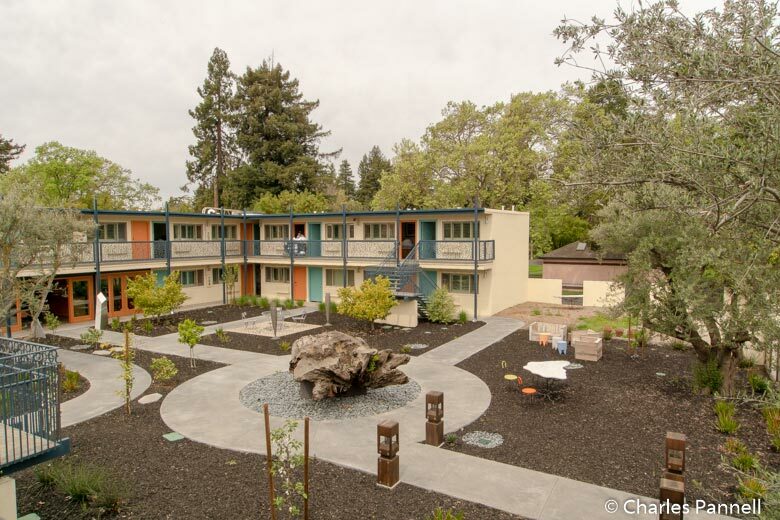 When the Astro Motel (www.theastro.com) opened its doors in 1963, the owners had high hopes that this Santa Rosa property would quickly become a favorite pick for Sonoma County visitors. Sadly that never happened, and over the years the motel fell into disrepair and became a neighborhood blight — that is until Liza Hinman entered the picture. Part of the local restaurant community since 2004, Hinman led the restoration efforts at this once neglected property that’s just around the corner from her popular eatery — The Spinster Sisters. Today, the vibrantly reborn Astro Motel not only exudes a decidedly retro charm, but it also offers top-drawer access for wheelchair-users and slow walkers. 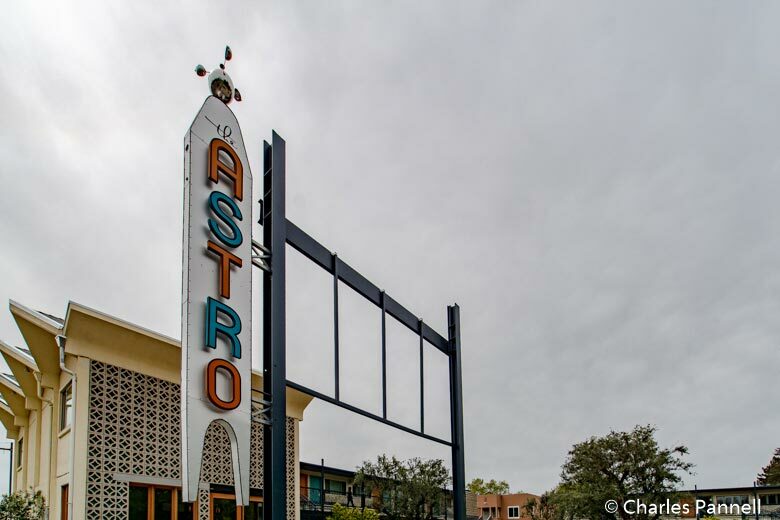 Accessible parking spaces — which weren’t even around back in 1963 — are located just steps from the vintage Astro sign, and there’s barrier-free access to the small lobby through automatic wood-trimmed glass doors. 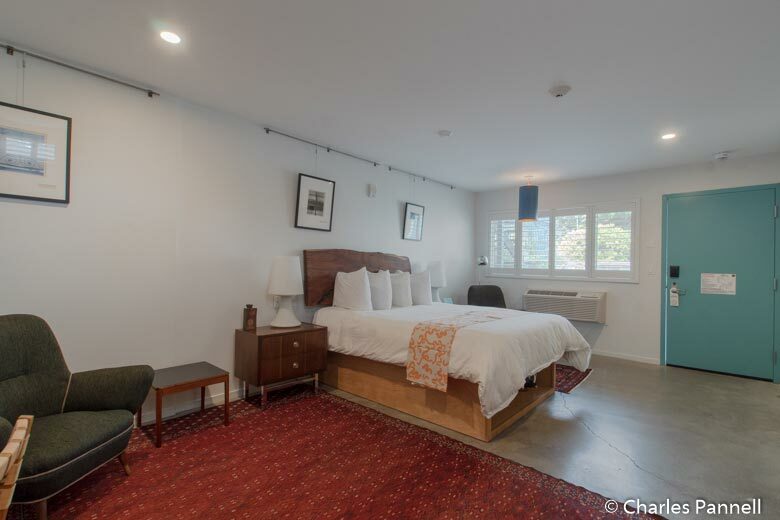 This delicate mix of past and present is repeated time after time at this 34-room property that’s decorated with midcentury furniture, yet incorporates modern access and energy efficient features. Gone is the massive cement parking area that once dominated the façade of this motor court motel. That ugly behemoth has been replaced with an inviting communal space that’s dotted with edible fruit trees and accented with tables and chairs. Level pathways wind through this courtyard, and there’s barrier-free access from the accessible parking area over to the nearby accessible guest rooms. An accessible public restroom is located between the lobby and the accessible guestrooms. Again, access was well thought out and nicely incorporated into the redesign of the property. The décor at the Astro Motel is best described as vintage Palm Springs meets the 60s Jetsons, and the midcentury furnishings were all acquired through nationwide auction houses — there are no reproductions here. Room 101 is the largest accessible room, and it features wide doorways, good pathway access and a polished concrete floor for easy rolling. The first thing that catches your eye in the room is the bold decorative rug that hangs on one wall, opposite a group of primary colored — and lowered — clothing hooks on the other wall. The 29-inch high queen-sized bed features wheelchair access on both sides; and the room also includes a desk with a chair, two night stands, an easy chair and a refrigerator. A pair of vintage cameras adorn the desk, and a photo of a young Joni Mitchell hangs nearby. Everywhere you look you’ll find subtle retro touches tastefully incorporated into the overall design. A second door leads out to a private patio, and the transition is nicely done with not even a slight lip. The patio is furnished with a table and two chairs, but there’s still plenty of room for even a large wheelchair outside. The cavernous bathroom includes a full five foot turning radius and is equipped with a roll-in shower with grab bars, a hand-held showerhead (as well as an overhead rainfall showerhead), and a fold-down shower bench. Again, great care was taken with the design and placement of the access features, including the fold-down shower bench which is located within easy reach of the shower controls. Other access features include a toilet with grab bars on the back and left walls (as seated), and a roll-under sink. 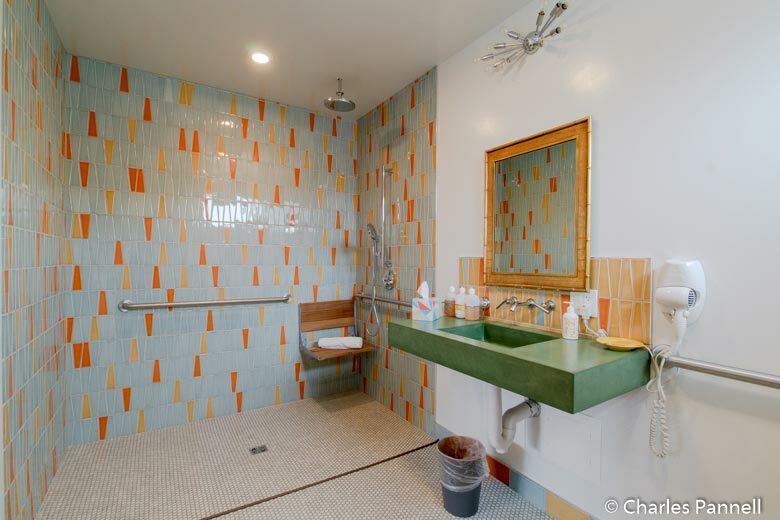 And the retro design was carried into the bathroom as well, with the application of vintage aqua, orange and yellow tiles throughout the shower enclosure. Room 102, which is located next door also includes the same access features. 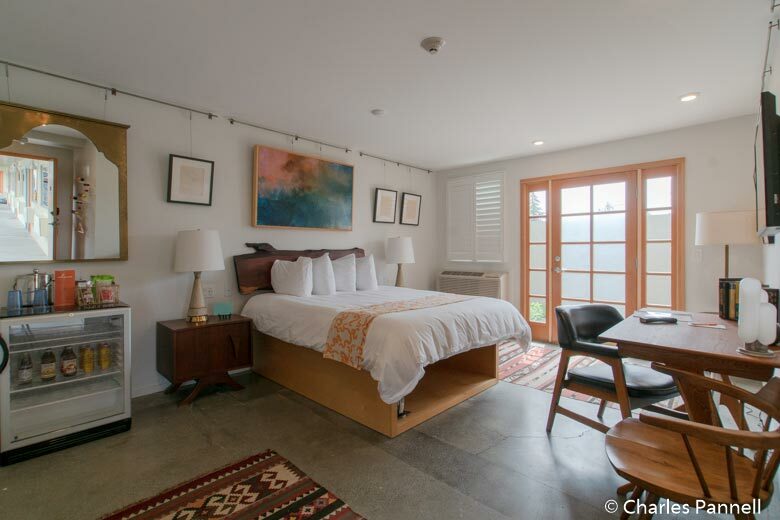 The only difference is that the sleeping area is a tad bit smaller and this room also lacks a patio. 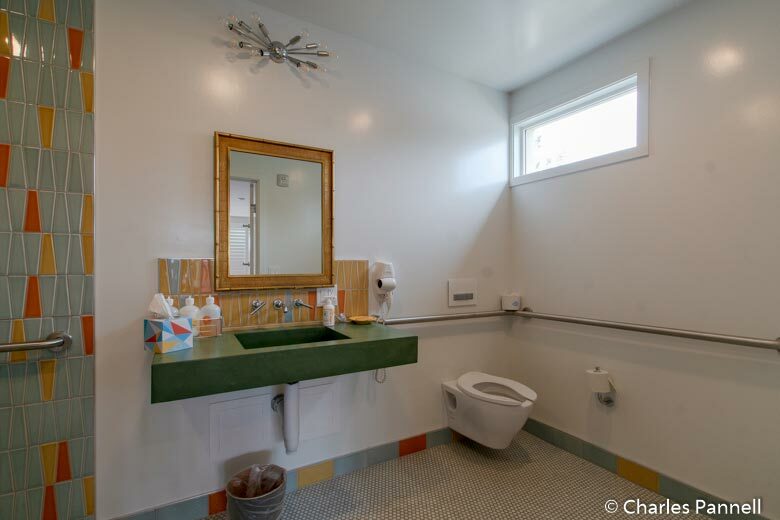 That said, the retro design touches — including more vintage cameras, the colorful bathroom tile and the midcentury accent pieces — are also found throughout this room. Visually it’s a sight to behold, as two classic black leather sofas dominate the room, with red and orange accent pieces strategically spaced around them A vintage starburst chandelier hangs overhead, and a collection of 1965 issues of Life magazine line one corner of the wood coffee table. Brightly colored red, blue, green and orange bell shaped lights hang above the reclaimed wood bar, and a vintage “fallout shelter” sign graces the far wall. Add in some 1960s tricycles and a metal Nehi sign and you have a real blast from the past. By far the most interesting piece in the room is a large rectangular glass-enclosed box that houses what looks to be an old time electronic device. And in a way it is, as it’s the original telephone relay equipment for the motel. When people called the property back in 1963, this piece of equipment directed calls to the correct extensions. It was found on the second floor during the renovation, and since the owners just couldn’t bear to part with this piece of history, they used a crane to lower it down to its current position. 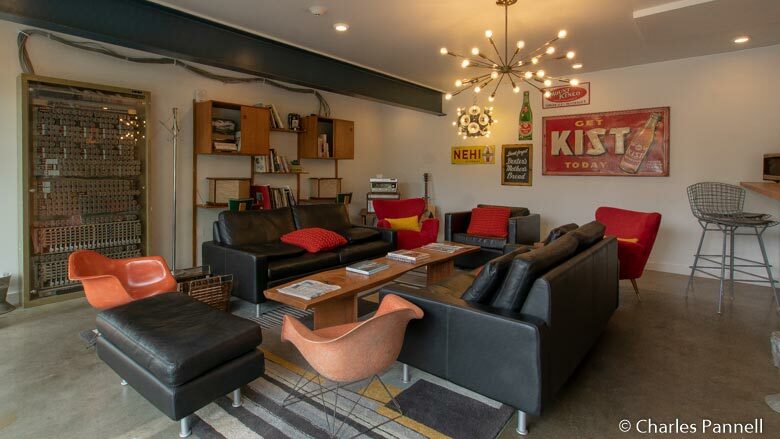 It makes a perfect cornerstone for the lounge as it’s a piece of the past that serves a purpose today — much like how the refurbished Astro Motel brought new life to the surrounding Santa Rosa Avenue neighborhood.